Photo of: East Coast of Ireland: Louth: Drogheda. This is an early-morning view of the Boyne Viaduct, a wonderful railway bridge that demonstrates that bridges can be works of art. The bridge was completed in 1855 and was designed by the Scottish engineer, Sir John MacNeill. 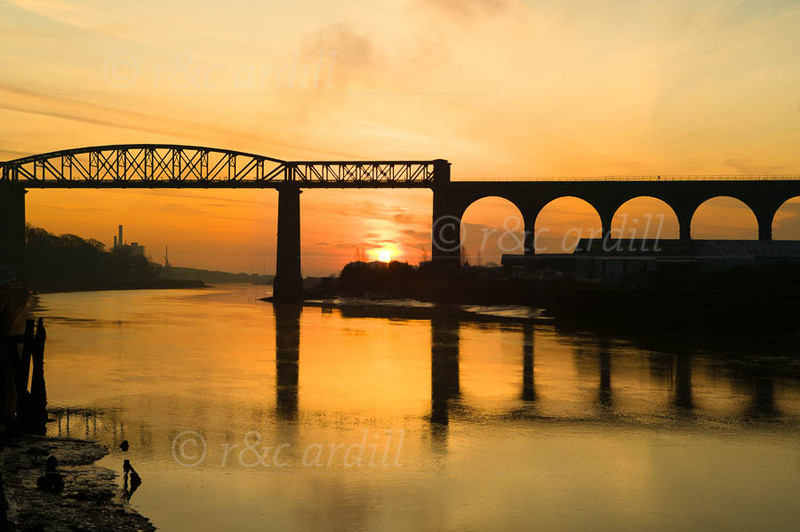 The rising sun gives a golden and timeless backdrop to what is essentially a world of industry and movement: the river itself, which was the gateway to the port of Drogheda, the railway bridge which was the main route from Dublin to Belfast, the factories to the left with their tall chimneys and smoke, and up above, the jetstreams.